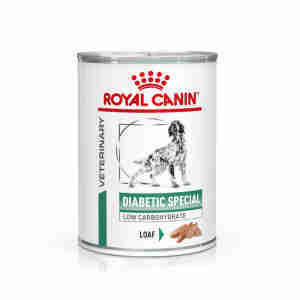 If your dog suffers with diabetes or tummy problems, Royal Canin Canine Diabetic Special is a nutritious (and delicious!) meal that will keep them healthy. If your furry friend has been diagnosed with diabetes, don’t worry; there are things you can do to help manage their condition. Diabetes is a common problem in dogs and your vet may recommend switching them over to Royal Canin Canine Diabetic Special food. Diabetes can cause weight gain, tiredness and mood problems – not nice for you or your pooch. However, managing your dog’s health with a good diet can improve their symptoms and allow them to live a healthy, happy life. low-GI recipe is gentle on your dog’s digestive system and helps process sugars. Diabetes is caused by a low insulin level, which means that your dog won’t be able to process sugar (found in carbohydrates) properly. This can lead to an unhealthily high level of blood glucose. The Royal Canin Canine Diabetic Special recipe only contains a small amount of carbohydrate, which helps to keep blood sugar levels low. The high-fibre recipe also helps to slow down absorption in the small intestine, allowing your dog to digest any sugars slowly. GI (glycaemic index) measures the amount of glucose in food and how easy and quick it will be to digest. Foods with a low GI are better for your dog because they can are digested more slowly, slowly releasing glucose into your dog's blood stream and keeping blood sugar levels constant. Royal Canin Canine Diabetic Special meals contain low-GI cereals. This meal will therefore be gentle on your dog’s tummy and eases the risk of hyperglycaemia (a sugar overload!) immediately after eating, when blood sugar levels are at their highest. Veterinary diets like this one have been specially made to support pets with specific medical conditions. Because of this, they might not be suitable for all pets, so we'd recommend getting professional advice before feeding them to your pet. If you think your cat could benefit from eating Hill's Prescription Diet Feline w/d, why not have a chat with your vet? Pork and poultry meat, pork and poultry liver, vegetable fibre, maize, minerals, cassia gum, sunflower oil, carrageenan, taurine, fish oil, trace elements (including chelated trace elements), Fructo-Oligo-Saccharides (FOS), marigold extract (source of lutein), vitamins. Always reliable, consistent tinned food. Excellent delivery from Medicanimal 5*all round! ...as it says on the tin! Does the job! My little sausage dog adores this tinned food, testimony in itself....as she's such a fussy little monkey/dog!!! Excellent quality food which suits my diabetic dog. I mix it with the dried food from same range and some fresh chicken. It helps to keep my dogs sugar stable. Since eating this our border terriers glucose has been consistent for over a year.